1. 304 grade stainless steel with a brushed surface. A stainless steel letterbox is 100% recyclable and the resulting environmental impact is almost non-existent. Our stainless steel letter boxes and stands have superior life cycle properties, if maintained correctly. 2. galvannealed coated steel, covered with a durable polyester coating. Using galvannealed steel offers huge advantages. It forms an optimal base for painting, making it an excellent choice for high-quality painted products. The surface is very uniform and matt-like, and therefore offers an ideal adhesion base for the paint. The painted surface has a very high corrosion resistance. Finally a primer and UV protective coating are added to the galvennealed steel. Our goal is to manufacture wall mounted post boxes and free standing post boxes which are built to last. We strongly believe in the use of top quality materials, which are long lasting, weather resistant and rustproof. Every year approximately 25,000 Bobi letterboxes are produced in our modern factory in Finland and sold worldwide. First manufactured in 1991 The Bobi Classic stainless steel letter box is one of the most popular boxes in the Bobi range. Every Bobi steel post box is made of 1mm thick steel, ensuring a strong, secure and durable box. All this have led Bobi letterboxes to be at the top end of the international letterbox market. We use the protective coatings of Akzo Nobel, the world's largest manufacturer of powder coatings. The coating protects your steel letterbox against the negative influences of UV and rain and ensures a good resistance against corrosion. The Bobi Classic, Grande, Jumbo, Duo, Trio and the Bobi Round stand are available in 10 different colours. We have all these colours in stock ensuring a rapid delivery. 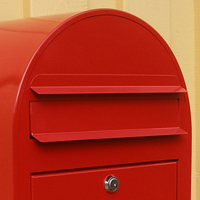 We also offer the possibility of having steel letter boxes coated in a colour of your choice i.e. to match the company logo. Please contact us to discuss the possibilities. Structured refers to the surface of this specific coating. It's not matt-like, but structured. This paint offers the highest protection against scratches and damages. 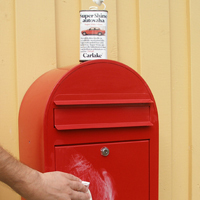 Companies and local government requiring a heavy duty steel letterbox will often opt for this special coating. A quality cylinder lock with dust cover secures the access door. Without using excess force, the letterbox can not be opened. Your post will be kept safe even if you are unable to empty it daily. The lock comes with 3 keys with an unique code. To ensure that rain can't get into the Bobi letterbox, each model has a protective lid attached to the letter slot. In the unlikely event that rain does get into the letter box i.e. during a heavy storm, the Bobi letterbox has special drainage holes in the bottom so that the water can run through. The Bobi Grande and Jumbo ranges are constructed with a sealing around the access door, which helps to keep the post dry even in severe weather conditions. These models also feature an unique inward opening letter slot, it closes itself after the post has fallen to the bottom of the letterbox. 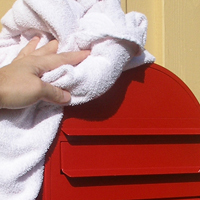 To ensure the life cycle of your letterbox and to avoid sedimation damage, we recommend to clean it once every 2 months. a car care super fast wax to protect the coating. This will protect the coating and reduce the dirt adhesion. Wash. Use a mild cleaning agent. Rinse well ... and dry the surface. Lubricate the lock with a quality oil lubricant. and access door move freely. will remain as good as new. For cleaning of Bobi stainless steel products, we recommend using a clean cloth and water. If this does not remove all the scale, you may use a special stainless steel cleaner to clean the surface. This will degrease the letterbox and leave a protective film. 1. Never use a scrubbing brush, this may cause irreparable damages to the stainless steel. 2. Always polish in the direction of the stainless steel. When you polish against the direction of the steel, scratches and colour variations may occur. 3. 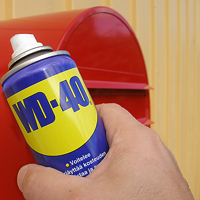 Always polish the whole letter box to ensure a homogenous finish without any colour variations. If you are unsure as to which cleaner to use, please contact our customer services. 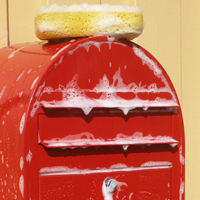 From experience we know that in some instances brown rust spots may appear on your letterbox. 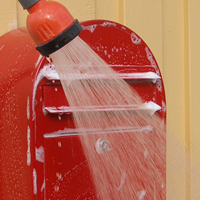 In such cases, we recommend you clean your letterbox with the special Finnish SAMPO powder (or any stainless steel cleaner containing oxalic acid). Please contact our customer services for further information.